Is this the year you’re going to make the leap to a new career? 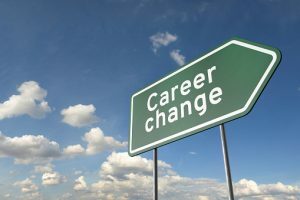 Sometimes a career change is inspired by the realities of the job market: salaries, demand, technology or any number of factors can be big motivators for a career change. Other times career changes are inspired from within: we get burned out, overwhelmed, underwhelmed, or just feel like it’s time to try something new. Whatever your motivation for thinking about a career change, CareerOneStop’s mySkills myFuture is a great place to get started. The website is easy-to-use, free, and includes unbiased career and employment information. The best part? You can get started exploring your new career in five minutes or less. mySkills myFuture takes your past or current job and shows you a list of careers that may use similar skills or work experiences. The list may include some jobs you’ve already considered . . . and some you’ve never even thought about it. From your list, you can choose to learn more about one or many careers, and you’ll find information on typical wages, job duties, and education requirements as well as links to local training programs and job listings. 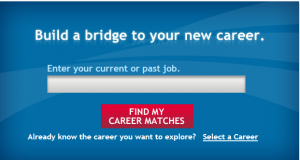 The site is easy to navigate on your own, but here are a few simple steps to help you get started building a bridge to your new career. 1) Visit mySkills myFuture and enter the name of your current job—or one you’ve held in the past. 2) Click “FIND MY CAREER MATCHES” to see a list of careers and job titles that use skills and knowledge you may already have from your current or past job. Which careers are labeled as “Bright Outlook” (occupations that are expected to grow quickly or have many job openings in the coming years)? Do the typical wages meet your salary requirements? Is the typical education in line with your education level or goals? 4) Follow the links to find details about careers you’re interested in. At any time, enter your city, state or ZIP code and click on “See Job Listings” or “Find Training” to view opportunities in your local area. Have fun exploring your next career move! And once you’ve visited mySkills myFuture, leave us a comment below to tell us what you like—or don’t like—about the site.